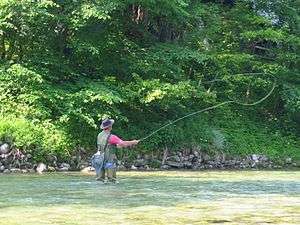 Land-based game fishing is a form of sport fishing in which anglers attempt to catch big-game fish from shore rather than from ocean-going boats. The locations for such activities are generally rock platforms, though wharfs, jetties and beaches are also common. Some species such as sharks can be targeted in shallow water, however most other species prefer deep water, and this limits the areas where these types can be fished in this way. Tackle used is usually comparable to that used for these species from boats, but some differences are necessary, such as changes in rod length. Different tackle is used according to location and species targeted. The billfish (marlin and sailfish) and the larger tuna (bluefin, yellowfin) are the main target species; smaller game fish are also sought, such as Spanish mackerel, dolphinfish, wahoo, smaller tuna species such as albacore and skipjack tuna, Australian longtail. Land–based shark fishing has had some popularity since the early 1900s. Some of the more sought species include large tiger sharks and hammerhead sharks, with sizes exceeding 500 lbs. Many land–based shark fishermen use catch and release techniques to return sharks to the water after capture. The best land–based game fishing is at present restricted to very few areas around the world. The best–known spots are in South Africa, New Zealand, Australia and the Andaman Islands, of which Barren Island and Narcondum volcano have produced marlin from the rocks. Along the east coast of Australia, land based game fishing can be divided into two fairly distinct geographic regions. On the north coast of New South Wales, from approximately Sydney north, light tackle is generally used, with smaller target species such as longtail tuna, Spanish mackerel and cobia. Particularly noted are the rock platforms of Jervis Bay, where black marlin of up to 200 pounds (91 kg) have been caught using bait floated out on balloons. South of Sydney, heavier tackle is used as the target species are generally much larger, with the main targets being black marlin, yellowfin tuna, kingfish and sharks.